Take the drama out of data collection by letting JotForm run the show. If you’re coordinating a visual or performing arts summer program for future artists, you want to spend your time organizing creative activities instead of sorting data. 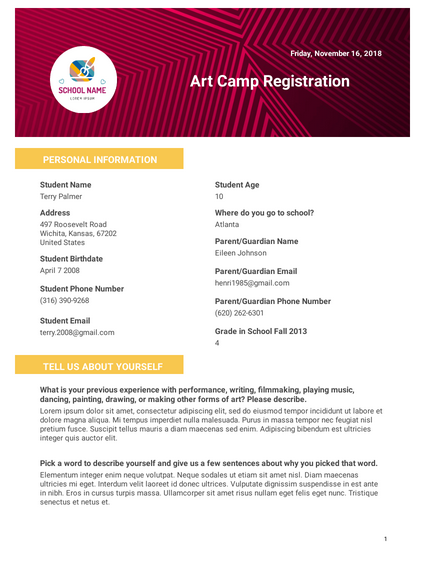 JotForm’s Art Camp Registration PDF Template will not only help you design the perfect registration form but also convert your students’ information into secure PDFs that are easy to access, download, and share. There’s no need to start with a blank canvas. This customizable template sets the scene for collecting contact and personal information as well as parental consent. With JotForm’s PDF Editor, you have the creative freedom to edit any of the provided form fields and even add your camp’s unique logo. You’ll end up with a masterpiece of a template that turns all submitted registration forms into state-of-the-art PDFs you can read anytime, anywhere. What is your previous experience with performance, writing, filmmaking, playing music, dancing, painting, drawing, or making other forms of art? Please describe. Nullam molestie nibh in lectus. Pellentesque at nulla. Suspendisse potenti. Pick a word to describe yourself and give us a few sentences about why you picked that word. Ut at dolor quis odio consequat varius. Integer ac leo. Pellentesque ultrices mattis odio. Tell us about a work of art you love. It could be a book you read, a play or movie you saw, song you listened to, or concert you went to. Why did you love it? What other activities are you involved with on a regular basis? Tell us a bit about these activities and why you enjoy them. How do you feel about performing? Is there anything else you want to tell us about why you want to join us? I release and waive, and further agree to indemnify, hold harmless or reimburse Challenge,Inc., the individual members, agents, employees and representatives thereof, as well as activity supervisors, from and against, any claim which I, any other parent or guardian, any sibling, the above-named child, or any other person, firm or corporation may have or claim to have, known or unknown, directly or indirectly, for any losses, damages or injuries arising out of, during, or in connection with the child's participation in the activities (including all forms of transportation) or the rendering of emergency medical procedures or treatment, if any.